Imagine having Dr. Frankenstein as your father. Your classmate and fellow pilot is a partial clone of your dead mother. You've been forced, by your father, to pilot a giant living robot named Eva Unit 01 to fight deadly creatures called "angels" from destroying the planet. And to top it off, you have raging teenage hormones and it's the end of the world if you screw up. No pressure. In Evangelion 1.01 You Are (Not) Alone, Tokyo-3 still stands after most of civilization was decimated in the Second Impact. Now the city endures the ceaseless onslaught of the deadly Angels, bizarre creatures bent on eradicating the human race. To combat this strange and ruthless enemy, the government agency NERV constructs a fleet of towering humanoid machines – the Evas – and Shinji Ikari is called into action, reluctantly taking his place at the controls of Eva Unit 01. Living a life of loneliness and questioning his existence, Shinji struggles to accept responsibility for mankind's battle for survival in this visually striking rebuild of one of the most important anime of all time. Shinji will fight the Angels alongside the only person who might understand his plight – Rei Ayanami, the elusive and frail pilot of Eva Unit 00. In this film experience not to be missed, Shinji and Rei will struggle to learn a simple truth: when carrying the burden of humanity's survival on your shoulders, you are not alone. OtakuUSA magazine writes that "Evangelion reminds us of what anime can be by having us flex all of our otaku muscles, yet always satisfies our basest needs for cute girls and mecha." Watch the first 8 minutes of the movie here. 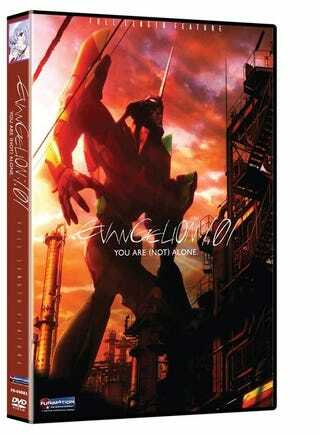 Evangelion 1.01 You Are (Not) Alone is available now on DVD. © khara. Licensed by FUNimation® Productions, Ltd. All Rights Reserved.